Tocilizumab is increasingly used in the treatment of large vessel vasculitis with recent approval for giant cell arteritis. To determine the efficacy and safety of tocilizumab in large vessel vasculitis in a real-life setting using different routes of administration. 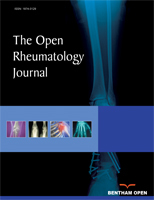 Retrospective analysis of consecutive patients at a tertiary rheumatology department who received tocilizumab for large vessel vasculitis. A total of 11 patients were treated with tocilizumab (8 giant cell arteritis, 2 large vessel vasculitis associated with rheumatoid arthritis, 1 Takayasu arteritis) after a median of 2 other steroid-sparing agents (range 1-4). Of these, 9 received tocilizumab as salvage therapy for active vasculitis and 2 due to the toxicity of their former steroid-sparing medication. After a mean follow-up of 23 months 7 patients were in remission as to vasculitis under a mean prednisolone dose of 1.7 ± 1.5 mg; one patient relapsed after long term remission having discontinued tocilizumab for elective surgery; one patient stopped tocilizumab after attributable infectious complications, and two patients died: one due to complications of vascular surgery, probably not attributable to tocilizumab; and the other due to sepsis secondary to sigmoiditis. Only 3 relapses occurred under continuous tocilizumab treatment. In all these 3 cases, renewed remission could be achieved by switching from subcutaneous (162 mg qw) to intravenous tocilizumab (8mg/kg q4w). Tocilizumab is efficacious in patients with large vessel vasculitis in a real-life situation. Safety appears to be acceptable, but infectious complications have to be considered. Intravenous tocilizumab may be used in patients who relapse under subcutaneous application. Keywords: Tocilizumab, Giant cell arteritis, Takayasu arteritis, Route of administration, Infections, Subcutaneous, Intravenous. © 2018 Schmalzing et al.